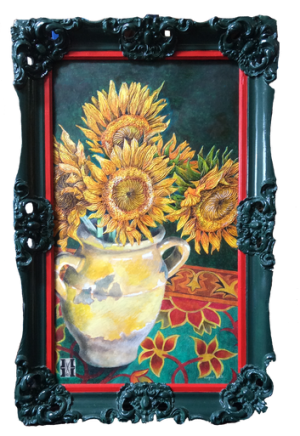 Margaret White’s subject matter includes the human figure and face, flowers, birds, insects, vegetables and jewelry. 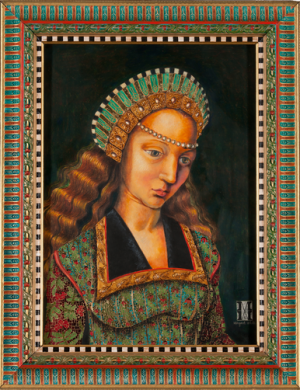 Her use of gold leaf and the arched form suggest a reverence to the viewer, and the ‘feel’ of an icon or altarpiece without the religious subject matter. 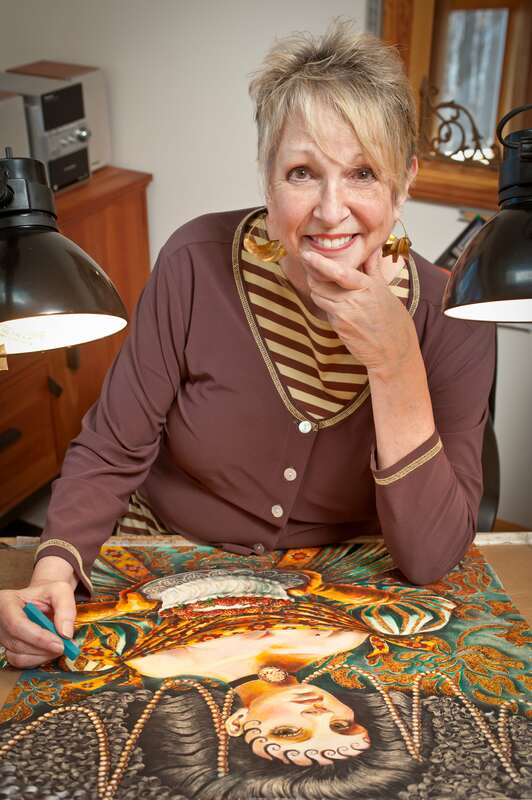 Margaret prefers oil pastel as her media choice, and uses the techniques of incising and shaving with a knife to attain various details and textures. 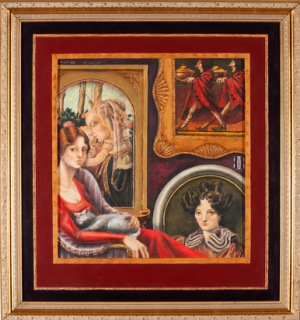 Margaret White’s “Art Collector” has a gold, hand-painted frame. Margaret White paints still lifes as cleverly as she does figures. 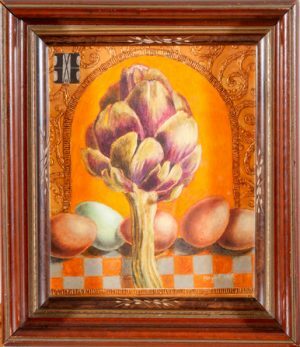 Margaret White’s still lifes are legendary, from their detail to their color. “Bartlett Pears” is no exception. 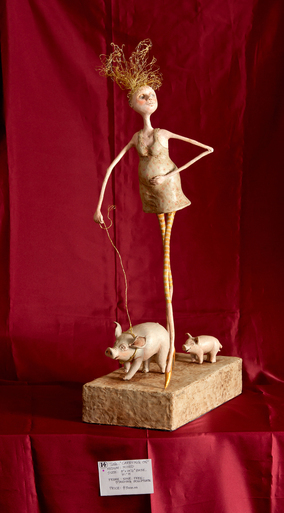 Margaret White stretches into mixed media sculpture with “Carrying On,” a whimsical depiction of a girl and her … pigs. 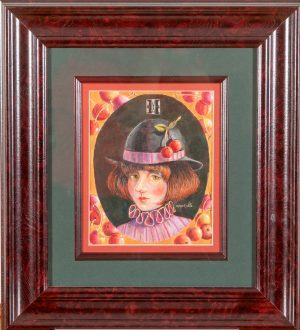 “Cherry Hat” by Margaret White is a whimsical oil-pastel painting, 19 inches wide by 21 inches high. “Contemplative” by Margaret White is an oil-pastel painting that shows White’s talent with frames as well. 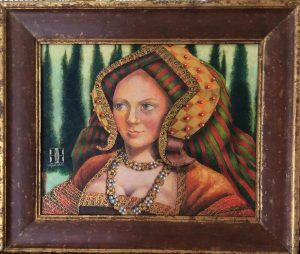 Courtier by Margaret White is an oil-pastel painting, 26.5 inches wide by 22.5 inches high. The woman with her red-and-green striped cap stands in front of a row of arborites. 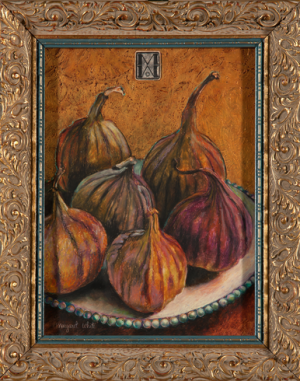 Margaret White shows her mastery of still life with “Fresh Figs,” an oil pastel painting. 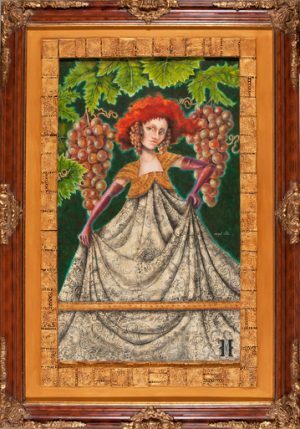 Margaret White’s “Grape Queen” showcases her mixed media talents in both the image and the frame. 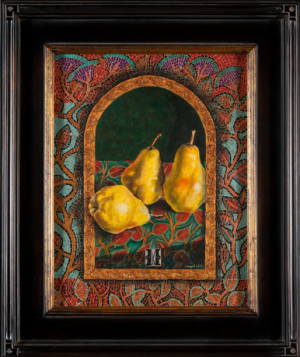 The wood frame features gold decor and has a hand-textured matte. 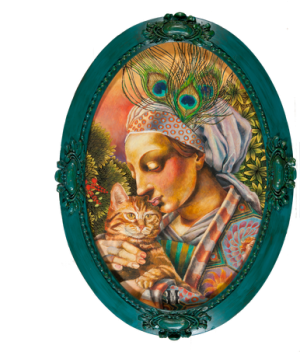 Margaret White’s “Gypsy Moon” is an oil-pastel painting in a hand-painted vintage frame. “Holbein-esque” by Margaret White is indeed Holbein-esque. 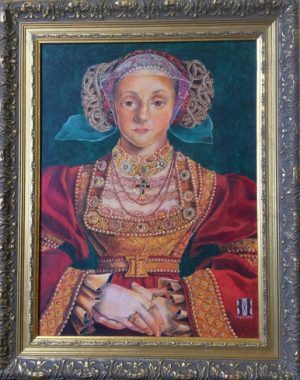 It is inspired by Holbein’s painting of “Anne of Cleves,” 1539, with the woman in an elaborate red gown and headgear.